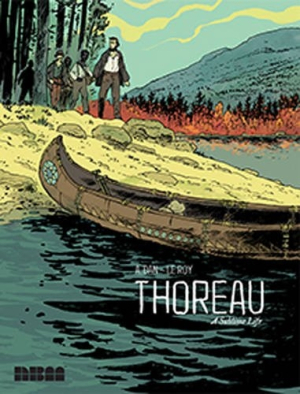 Maximilien Le Roy and artist A. Dan illustrate the life of writer and philosopher Henry David Thoreau, in the graphic novel Thoreau: A Sublime Life. Similar to John Porcellino’s graphic novel Thoreau at Walden, Le Roy begins with Thoreau at Walden Pond, living a simple life as a writer and farmer. However, where Porcellino’s book focuses solely on Thoreau’s time at Walden, Le Roy proceeds to expand the view through action and Thoreau’s own words—his philosophy of civil disobedience, his role as an active abolitionist, and his thoughts about religion and the Native American model of living. The limited use of captions makes one scene seem to fall into the next, dreamlike, a choice that allows the narrative to flow easily, but also relies on an attentive reader. In a three-page scene portraying the 1856 Pottawatomie Creek Massacre, its leader, John Brown, is not identified, and there’s no link to Thoreau until ten pages later, when Brown and Thoreau are shown talking. Brown plays a more prominent role than one might expect, as Thoreau defends the violent abolitionist, notably disagreeing with none other than Abraham Lincoln. An afterword by Professor Michael Granger, a specialist in the study of Thoreau, sheds more light on the evolution of Thoreau’s philosophies, including this apparent acceptance of violence in some situations. It’s this more complete view, as delivered through A. Dan’s detailed art, that makes Thoreau: A Sublime Life a necessary and valuable addition to the graphic literature about Thoreau.